Isn’t it cool? All the Little Moons have the same cover, with just the title font/color being different. The Little Moons are the short story works of Crescent Moon Press authors, another way to get our name out there. And they all go for only 99¢! A terrific way to “taste” new authors. It’s December, and Los Angeles is in the grip of a serial killer – or so Gregor Caine would like to believe. But the moon grows fat as it builds toward the Winter Solstice and a rare eclipse. An old woman searching for a friend gone missing believes danger is coming, and the Blood Dreams that keep interrupting Gregor’s sleep portend a swarm of demonic activity. ~ This is definitely a bridge between book 1, Demon Soul, and book 2, Demon Hunt (which will be out this summer); mostly restless intrigue and no romance…but it carries a lot of hints about both Book 1, 2, and the culminating adventure in Book 3, so it’s a short story packed with information. 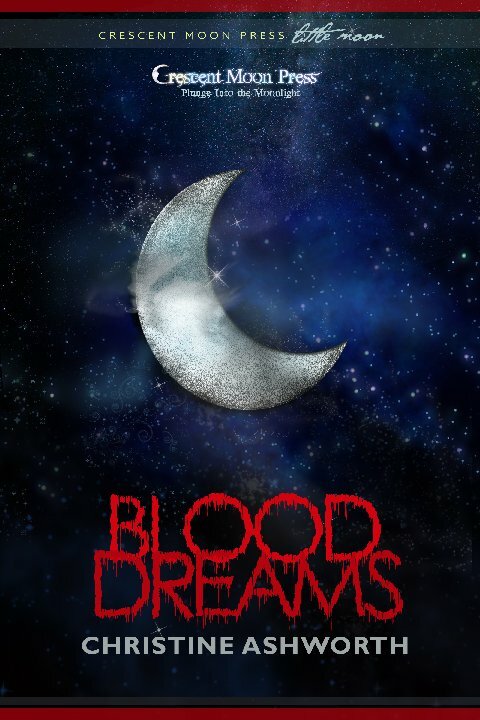 So there you go – Blood Dreams will be out June 1st, for 99¢ only. Mark your calendars, lol! This entry was posted in Writing and tagged Blood Dreams, Caines, Christine Ashworth, Cover Reveal, Crescent Moon Press, June 1 release date, Little Moons, short story. Bookmark the permalink. 26 Responses to BLOOD DREAMS Cover Reveal! Congrats on the wonderful new cover..It does look cool for sure.. Thanks, Savannah! It’s also smart branding – the reader knows, with that cover, that they’re getting a short story. That cover is so mystical. It’s spooky. Emma, the story is kinda spooky, too! Nice cover! You should do lots of promoting around Halloween with that one! Great point, Roz…I will definitely do that! YES! Something to tide me over until book 2. Most excellent. Simple, elegant, alluring. What more could a girl ask? Christine, I’m so happy for you!!! What a lovely mystical cover. The story sounds intriguing. Congrats! again. Thanks, Lisa! Yes, gotta try it, right? Hugs! Wow! Love it! I’m a sucker for the moon and stars! Beautiful! Congrats on this cover. It’s awesome, and the blurb caught my attention. I can do without the romance, but not the intrigue. I’ll keep a look out for this. I really like that book cover! Congratulations, and please remind everyone when June 1st rolls around. Fantastic. It’s just eerie enough to draw me in. That’s a great cover. Love it! The blurb sounds intriguing. Congrats. How exciting. Love anything with a moon on it, especially crescent moons. Looking forward to the read. I was thinking the same thing, great combination of excitement and chills! Yay a fellow Little Moonie! I love the lettering, nice! Can’t wait to read it.